The image below illustrates the pathogenesis of asthma. 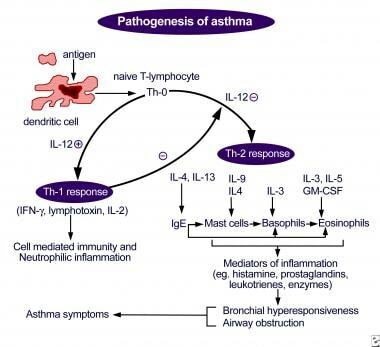 Pathogenesis of asthma. Antigen presentation by the dendritic cell with the lymphocyte and cytokine response leading to airway inflammation and asthma symptoms. Exercise-induced asthma is generally a clinical diagnosis. Laboratory evaluation is usually reserved for equivocal cases, for treatment failures, and to narrow the differential diagnosis. Laryngoscopy can be performed to evaluate for foreign body or other obstruction in the upper airway. Postexercise laryngoscopy can be used to evaluate for vocal cord dysfunction, a condition often mistaken for exercise-induced asthma. Treatment of the athlete who is experiencing an acute attack of exercise-induced asthma is the same as in any asthma attack situation and includes immediately removing the patient from competition or play. The basis of treatment for exercise-induced asthma is with preexercise short-acting beta2-agonist administration. There is less of a role for traditional asthma medications (eg, corticosteroids, theophylline) in managing pure exercise-induced asthma. With proper interventions, the prognosis is excellent for athletes with asthma. Most symptoms can be prevented, and performance should not be limited by EIA with proper treatment (see Prognosis). Exercise-induced urticaria, or exercise-induced anaphylaxis, is often presumed to be related to EIA, even though this condition is extremely rare and unrelated (see Diagnostic Considerations). Go to Asthma, Pediatric Asthma, Exercise-Induced Anaphylaxis, Angioedema, and Urticaria for more information on these topics. EIA usually affects individuals who participate in sports that include an aerobic component. The condition can be seen in any sport, but EIA is much less common in predominantly anaerobic activities. This is likely due to the role of consistent and repetitive air movement through the airways (seen in aerobic sports), which affect airway humidity and temperature. EIA triggers an unknown biochemical and neurochemical pathway, resulting in the bronchospasm, which manifests as the symptoms of the disease. Although the exact mechanism of EIA is unknown, there are 2 predominant theories as to how the symptom complex is triggered. One is the airway humidity theory, which suggests that air movement through the airway results in relative drying of the airway. This, in turn, is believed to trigger a cascade of events that results in airway edema secondary to hyperemia and increased perfusion in an attempt to combat the drying. The result is bronchospasm. The other theory is based on airway cooling and assumes that the air movement in the bronchial tree results in a decreased temperature of the bronchi, which may also trigger a hyperemic response in an effort to heat the airway. Again, the result is a spasm in the bronchi. Many authors believe there may be a combination of the above 2 theories that takes place, but the biochemical or physical pathways that mediate these responses are unclear. Evidence may even exist to support the idea that the resulting cascades are not the inflammatory pathways to which we attribute allergic asthma. Likewise, certain sports and their environments predispose individuals with asthma to experience EIA. Sports played in cold and dry environments usually result in more symptom manifestation for athletes with this condition. On the other hand, when the environment is warm and humid, the incidence and severity of EIA decrease. The causes of EIA can be divided into the categories of medical, environmental, and drug related. Eliminating some causes can diminish—but may not eliminate—the athlete's symptoms. EIA may also exist without the presence of any of these causes. Poorly controlled asthma results in increased patient symptoms with exercise. Maximizing control of the patient's baseline asthma, when present, is critical in the treatment of EIA. In addition, poorly controlled allergic rhinitis also results in increased patient symptoms with exercise, and secretions resulting from hay fever can aggravate both allergic asthma and EIA. Viral, bacterial, and other forms of upper respiratory infections also aggravate the symptoms of EIA. Controlling the secretions of these illnesses, as with allergic rhinitis, can make the EIA symptoms much more tolerable. Excess of pollens or other allergens in the air can exacerbate the allergic and exercise-induced forms of asthma. Pollutants in the air are irritants to the airways and can lower the threshold for symptomatic bronchospasm. The prognosis is excellent for athletes with asthma. With proper interventions, most symptoms can be prevented, and performance should not be limited by EIA if this condition is treated properly. Newly diagnosed young athletes need to be educated that this condition should not be perceived as an insurmountable disability. Using examples of the numerous elite athletes (eg, Jackie Joyner-Kersee [track and field Olympian]; Amy Van Dyken [Olympic swimmer]; Jerome Bettis [former running back for the Pittsburgh Steelers]) with this condition can help young impressionable athletes continue in their endeavors without fear of failure or medical distress. Patient education is a critical part of the treatment of EIA. Once the diagnosis is made, athletes should be encouraged to continue in their activities with the reassurance that proper treatment can allow for an unhampered performance for most individuals. In addition to reassurance, it is also important to teach individuals to recognize the signs of an impending attack. Once recognized, individuals should be taught to remove themselves from the aggravating activity and initiate treatment as necessary. This includes education about the proper choice of agents to abort an acute attack (ie, albuterol), but not cromolyn, salmeterol, or an inhaled steroid. Teaching the proper mechanics of inhalant medication administration is also important, along with, if needed, teaching and demonstrating the proper use of a spacer device to the patient; without the proper mechanics in using such devices, the medication does not reach the area of pathology and does not benefit the athlete. Education of the coaching staff is also crucial, because coaches need to know that shortness of breath in athletes does not always indicate poor conditioning and that the consequences of ignoring an asthma attack can be serious. For patient education information, see the Asthma Center, as well as Asthma, Asthma FAQ, and Exercise-Induced Asthma. Anderson SD. How does exercise cause asthma attacks?. Curr Opin Allergy Clin Immunol. 2006 Feb. 6(1):37-42. [Medline]. Hough DO, Dec KL. Exercise-induced asthma and anaphylaxis. Sports Med. 1994 Sep. 18(3):162-72. [Medline]. Smith BW, MacKnight JM. Pulmonary. Safran MR, McKeag DB, Van Camp SP, eds. Manual of Sports Medicine. Philadelphia, Pa: Lippincott-Raven; 1998. Vol 1.: 244-9. Kaplan TA. Exercise challenge for exercise-induced bronchospasm: confirming presence, evaluating control. Phys Sports Med. 1995. 23(8):47-57. Rundell KW, Anderson SD, Spiering BA, Judelson DA. Field exercise vs laboratory eucapnic voluntary hyperventilation to identify airway hyperresponsiveness in elite cold weather athletes. Chest. 2004 Mar. 125(3):909-15. [Medline]. Storms W. Update on montelukast and its role in the treatment of asthma, allergic rhinitis and exercise-induced bronchoconstriction. Expert Opin Pharmacother. 2007 Sep. 8(13):2173-87. [Medline]. Steinshamn S, Sandsund M, Sue-Chu M, Bjermer L. Effects of montelukast and salmeterol on physical performance and exercise economy in adult asthmatics with exercise-induced bronchoconstriction. Chest. 2004 Oct. 126(4):1154-60. [Medline]. Wilson JJ, Wilson EM. Practical management: vocal cord dysfunction in athletes. Clin J Sport Med. 2006 Jul. 16(4):357-60. [Medline]. Kenn K. [Vocal Cord Dysfunction--what do we really know? A review]. Pneumologie. 2007 Jul. 61(7):431-9. [Medline]. de Aguiar KB, Anzolin M, Zhang L. Global prevalence of exercise-induced bronchoconstriction in childhood: A meta-analysis. Pediatr Pulmonol. 2018 Apr. 53 (4):412-425. [Medline]. Stensrud T, Berntsen S, Carlsen KH. Exercise capacity and exercise-induced bronchoconstriction (EIB) in a cold environment. Respir Med. 2007 Jul. 101(7):1529-36. [Medline]. Butcher JD. Exercise-induced asthma in the competitive cold weather athlete. Curr Sports Med Rep. 2006 Dec. 5(6):284-8. [Medline]. Lin LL, Huang SJ, Ou LS, Yao TC, Tsao KC, Yeh KW, et al. Exercise-induced bronchoconstriction in children with asthma: An observational cohort study. J Microbiol Immunol Infect. 2017 Sep 6. 1 (8583):483. [Medline]. Gould CF, Perzanowski MS, Evans D, Bruzzese JM. Association of exercise-induced wheeze and other asthma symptoms with emergency department visits and hospitalizations in a large cohort of urban adolescents. Respir Med. 2018 Feb. 135:42-50. [Medline]. Weiler JM, Hallstrand TS, Parsons JP, Randolph C, Silvers WS, Storms WW, et al. Improving screening and diagnosis of exercise-induced bronchoconstriction: a call to action. J Allergy Clin Immunol Pract. 2014 May-Jun. 2(3):275-80.e7. [Medline]. Beaudouin E, Renaudin JM, Morisset M, Codreanu F, Kanny G, Moneret-Vautrin DA. Food-dependent exercise-induced anaphylaxis--update and current data. Eur Ann Allergy Clin Immunol. 2006 Feb. 38(2):45-51. [Medline]. Sánchez-García S, Rodríguez del Río P, Escudero C, García-Fernández C, Ibáñez MD. Exercise-induced bronchospasm diagnosis in children. Utility of combined lung function tests. Pediatr Allergy Immunol. 2015 Feb. 26 (1):73-9. [Medline]. Weiler JM, Brannan JD, Randolph CC, Hallstrand TS, Parsons J, Silvers W, et al. Exercise-induced bronchoconstriction update-2016. J Allergy Clin Immunol. 2016 Nov. 138 (5):1292-1295.e36. [Medline]. Parsons JP, Hallstrand TS, Mastronarde JG, Kaminsky DA, Rundell KW, Hull JH, et al. An Official American Thoracic Society Clinical Practice Guideline: Exercise-induced Bronchoconstriction. Am J Respir Crit Care Med. 2013 May 1. 187(9):1016-27. [Medline]. Stelmach I, Sztafiska A, Jerzyska J, Podlecka D, Majak P, Stelmach W. New insights into treatment of children with exercise-induced asthma symptoms. Allergy Asthma Proc. 2016 Nov. 37 (6):466-474. [Medline]. ProAir Digihaler (albuterol) [package insert]. Frazer, PA: Teva Respiratory, LLC. 12/2018. Available at [Full Text].